Whether you're entertaining at home or you're out in public, knowing when and how to use proper manners and etiquette is essential. However, how do you know what is correct and what isn't? Learn about etiquette and entertaining with in-depth explanations and answers from our staff at Entertaining with Grace. 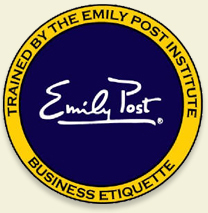 We've been helping people worldwide learn proper etiquette through our online resources for more than three years. Entertaining with Grace.com is designed to provide information and respond to your specific questions. Contact us today for help with becoming a gracious host or hostess in today’s hectic and complex world. Don't expect to see your question quoted on our Website as we view that as being much too personal and intimate. Instead, we respond to you privately and directly by email. However, we will address your question in articles that we post online. If one person asks a question, there are many others who have the question but haven't asked it. Thank you for taking the time to contact us as it helps us ensure we're providing the information you want. This is your opportunity to ask those questions about which fork to use or how to set a formal table! Though well qualified and experienced, our staff is all volunteer and we may not be able to respond immediately. Be patient, as we strive to get you an answer within 48 hours or less. Please visit our companion websites, www.ladypersonified.com and www.questionofmanners.com, for more detail and the history of etiquette. There you can find daily tips on a variety of related topics. Email our expert staff today at askus@entertainingwithgrace.com.